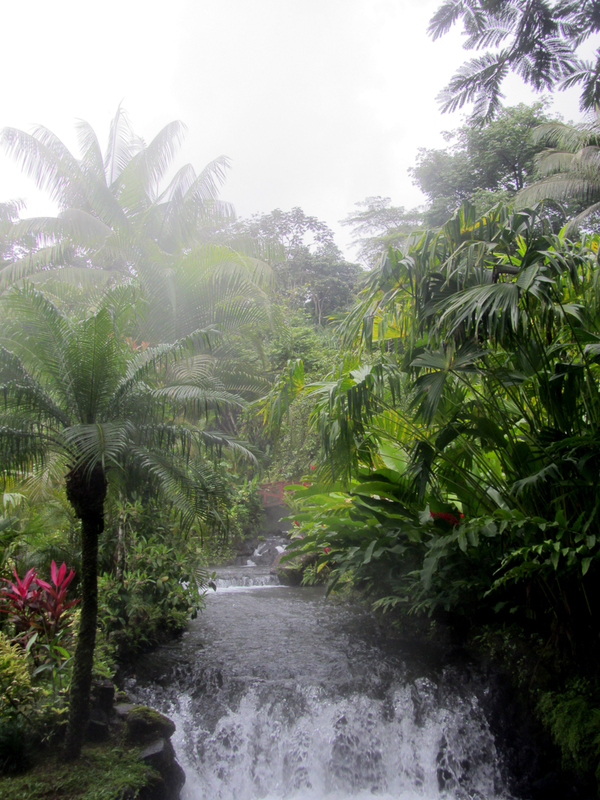 Costa Rica: Itinerary Ideas for a 10 Day Self-Guided Vacation! So you’ve found yourself with a week of vacation, and you came to the brilliant conclusion that you want to visit Costa Rica. What all can you comfortably fit into a 9-10 day trip? Lucky for you, I spent two months in Costa Rica during a study-abroad trip, and I will tell you! After perusing guidebooks, reading online travel forums, and talking to locals and visitors alike, here is the itinerary I developed. With somewhat limited time, we really fit a lot in, and this schedule gave us a great taste of the variety of landscapes and experiences this country can offer. Since almost all visitors fly into the SJO airport, this is a good place to start! While this city can provide a somewhat dismal view of the country as a first impression, it really isn’t so bad if you don’t spend too much time there. Depending on when your flight gets in, you can visit the Teatro Nacional, the many wonderful museums (Museo de Jade is a personal favorite), the lively tourist market, or grab some dinner and a churro from a street vendor. Check this link for more ideas! Leave San Jose in the morning, and head to this central part of the country. Getting here can be a bit rough, but it is all worth it upon arriving! We did a day-trip here through Viator , but it was too much driving in one day and not enough time at the location. So, I recommend taking a shared shuttle through Easyride CR (a company which I generally had a great experience with), and checking into a hotel in the town of La Fortuna. 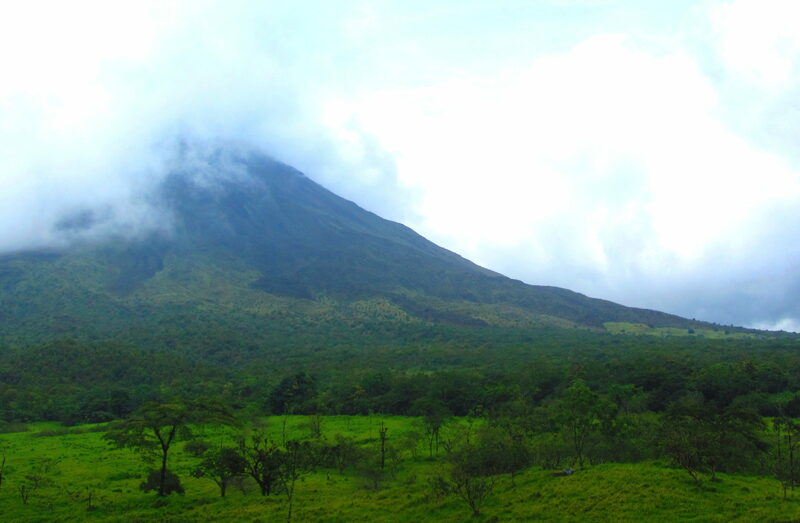 Once there, book a day tour, or visit Arenal Volcano on your own. Then, be sure to visit the natural volcanic hot springs for a dip. I’ve been to the thermal spa and resorts at both Baldí and Tabacón, and each were amazing- Just research what better fits your budget. Swimming in natural hot springs with a volcano in the background is an amazing experience! 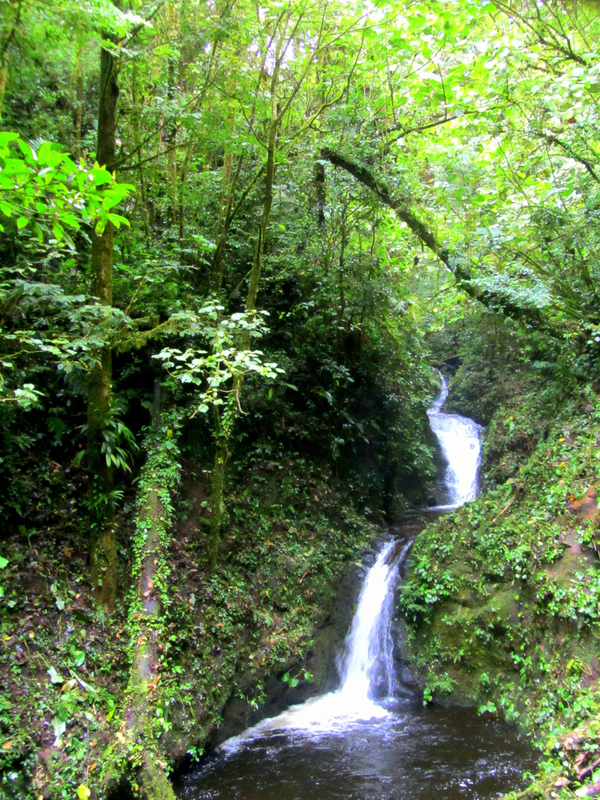 In the morning, take a shuttle from La Fortuna to the coniferous cloud forest of Monteverde. Just a heads up- this drive is not for the faint of heart! With narrow, one way, mountain roads and cliff-side views the entire way, it is certainly a little scary, but all part of the experience. 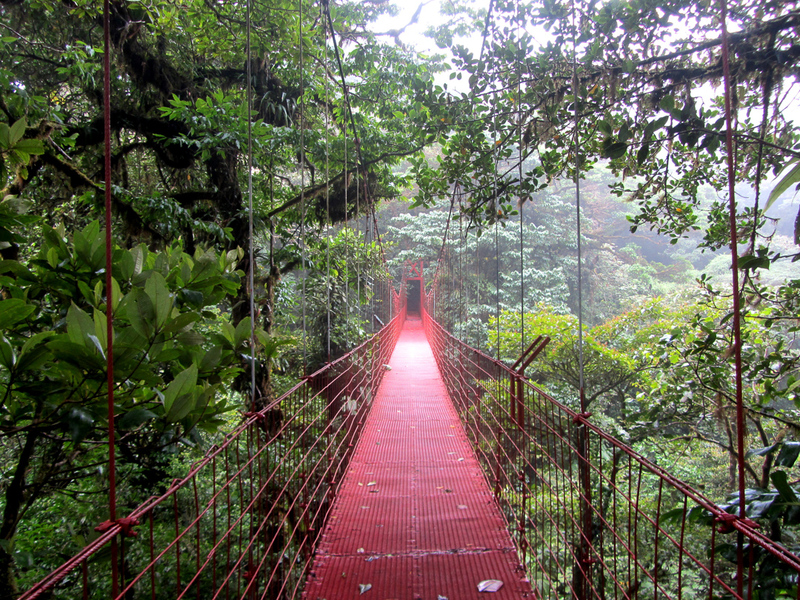 The base of exploration for the Monteverde Cloud Forest is the town of Santa Elena, and after arriving and exploring the town, head to the national park entry and spend the day hiking the beautiful trails and walking across the suspended bridges above the forest canopy. We also chose to do a night-hike tour through our hostel (with the company Kinkajou) for some extra exotic wildlife sightseeing. If only for the thrill of being in the jungle at night and seeing lots of giant insects, it was worth it! Since zip-lining or doing a “canopy tour” is a quintessential part of any Costa Rica visit, its best to do it here in Monteverde, the place with the best views. We went with the company Selvatura (which I highly recommend! ), and did a 3 hour canopy tour ($45US). Despite the rain, we all had a blast, and the company provided round-trip transportation from our hostel. When we returned to town in the afternoon, we had a relaxed evening and got dinner at a tree-house restaurant. This itinerary is pretty aggressive, and by this point you will want the rest! My brother Matt just zipping away! Using the shuttle service from EasyrideCR, we left town at 8:30am and arrived to Quepos (the base point for exploring Manuel Antonio National Park) at 2pm. I would advise this shuttle service as it is another long, treacherous drive (and on a backpackers budget this is the best way to do it)! 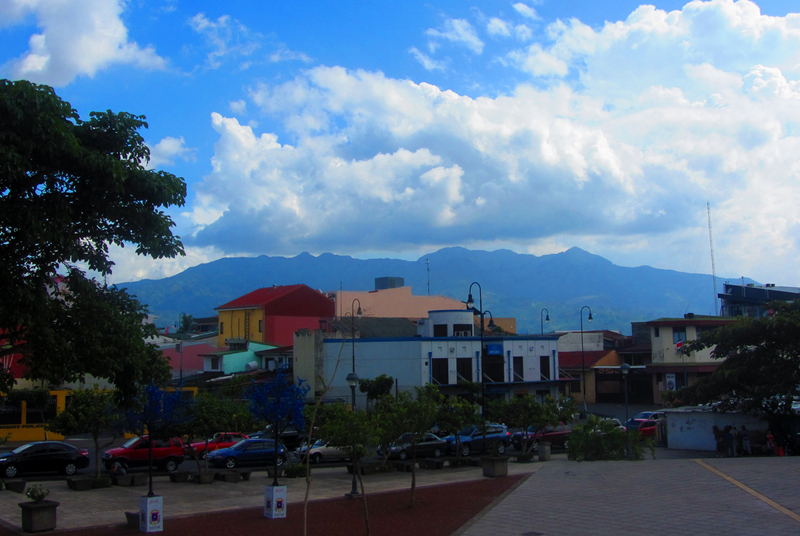 Spend the afternoon exploring the plethora of restaurants and shops in Quepos, and visit the public beach for a swim. The national park closes early, so I say save it for the following day so you can get the most out of your ticket. This park is crowded and full of tourists, but for good reason. It is pure jungle, and you are almost guaranteed several wildlife sightings. We did not hire a naturalist guide (which you will be hounded by near the entry! ), and still saw 3 wild sloths, many Capuchin monkeys (babies too! ), as well as several reptiles while walking the trails. Walk slow, explore, swim in the warm ocean, watch out for thieving raccoons on the beach, and you’ll have a fantastic time! We originally had not scheduled two days here, but since we loved it so much we re-arranged our schedule- and I am glad we did! With this extra day you can explore additional parts of the park, the town, or participate in various ocean activities. There are plenty of companies offering kayaking, surfing lessons, boating, fishing trips, etc. – the opportunities here are endless! Leave town on a shuttle late at night (this must be arranged in advanced), and you can sleep through the boring drive back to San Jose. Leave your San Jose hotel early in the morning, and jump on a van to the Caribbean province of Limón. Because the area where the Tortuguero National Park lies is extremely remote, and in the middle of a somewhat dangerous region, I would really recommend scheduling a tour company to get you there and back. You can go it alone, but with limited time and flexibility this is the best option. We went with the company Exploradores Outdoors, and had a great experience. The journey there is full of great sights and wildlife, and the ride on the tiny boat you have to take out into the canals towards the park is an unforgettable experience. Wrap up your hiking, boating, and wildlife sighting and begin the drive back towards the big city. Once back in San Jose, relax, and eat some casado with a side of Imperial beer for the final time. Head to the airport, and back home. If you leave on Day 11 – I would recommend extending the trip by taking a cultural day-trip out of the San Jose area, perhaps to visit the stunning nearby Poas Volcano, or spending another day in the fascinating and remote Tortuguero National Park. Know a college age student who wants to study abroad in Costa Rica? I’ve been blogging about Chester and me visiting Costa Rica. We were in Jaco, visiting Manuel Antonio. We’re heading to Monte Verde next. Sounds like a fun trip. I have to say, i really love the photos used in the article. Great tips! I’ve got my trip almost completely planned, and it was very reassuring to see it matches a lot of what you recommend. Thanks!! Yikes! Very ambitious! We did Manuel Antonio, Monteverde and Arenal in 12 days and felt rushed. I’d recommend 3 days in each area and a day for travel – keeping in mind travel time to get to each is 3-4 hours. Such a great country! That’s true- perhaps I should use a different word. I spent 7 weeks in a small suburb of San Jose which I really enjoyed, but somehow I never quite found a part of the city that I truly liked beyond a small area or row of streets. It is worth a visit though for tourists, just not too long of a time I’d think. Beautiful pictures! Looks like a great trip! Hi! I am planning a 10 day Honeymoon in Costa Rica from Nov 26 – Dec 5! I have a similar proposed itinerary… I was wondering if you went to Puerto Viejo? I am thinking of heading there instead of Tortuguero National Park -I would love to hear your experience there and why you may choose one location over another. Hi Sarai- I’ll send you an email! Can you let me know what it is? Great information, thank you. For those of us not familiar with the country, a map would have been helpful.